Made up with innovative modern design. 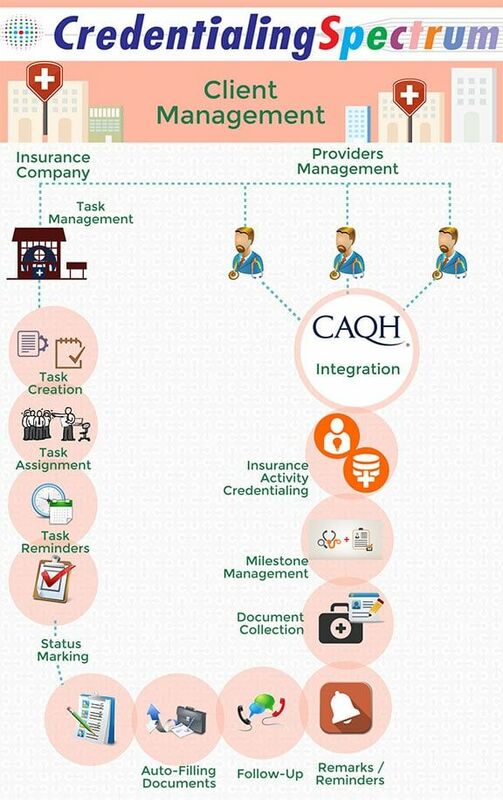 Automated CAQH Profile Import and Update. 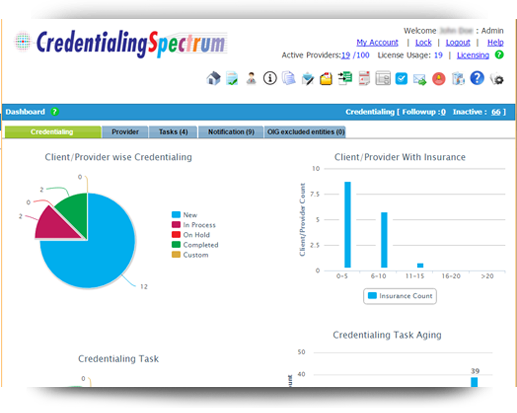 The dashboard allows a pictorial overview of the various credentialing tasks that are currently in activity for the providers. 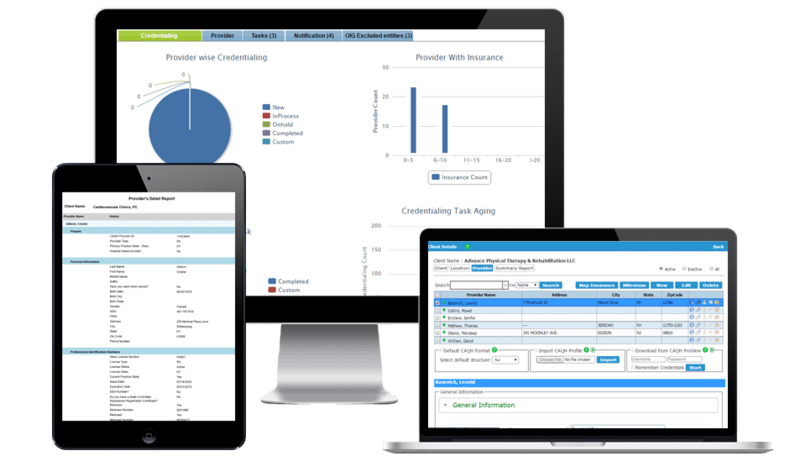 The quick glance screen, gives a brief overview of the status of credentialing assignments, provider/insurance count, the status of tasks set by the users, and the credentialing task aging. Users can click over any specific area within the chart (s) to view a detailed analysis for the allotted segment of the dashboard. CAQH Import for creating physician’s profile. 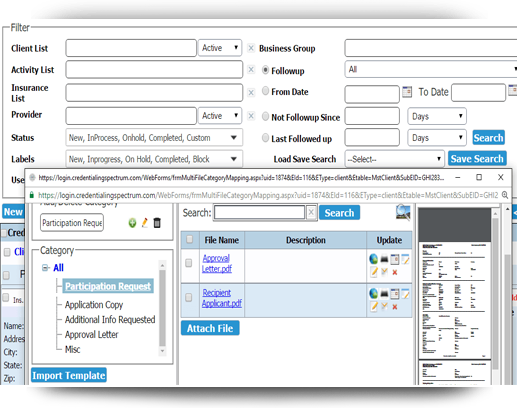 Provides 7 layers of source verification feature added on top of basic OIG Sweep that includes exclusion search and license verification. Now, You can perform source verification for Group or Individual Provider. Verified search option can refine exclusions and pinpoint accurate results. 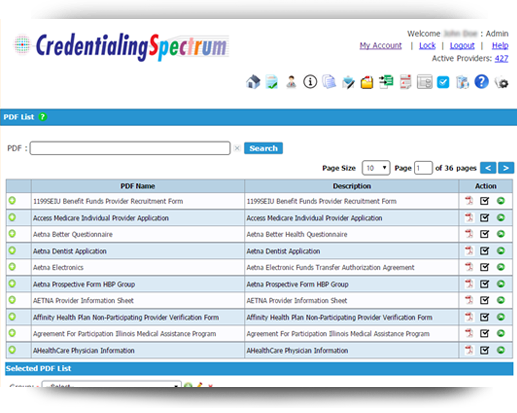 The PDF forms display a library of the insurance companies’ application forms for the providers. 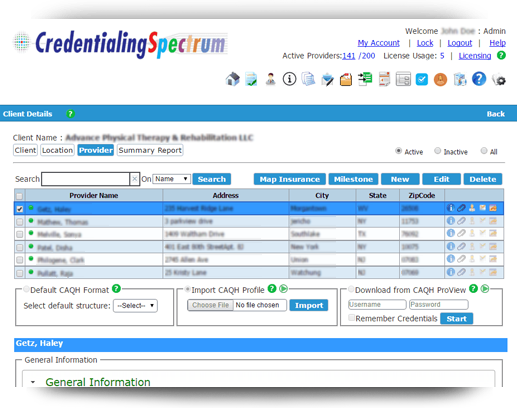 They are auto-filled for each provider for the credentialing process, as they are lengthy and time consuming to fill manually. 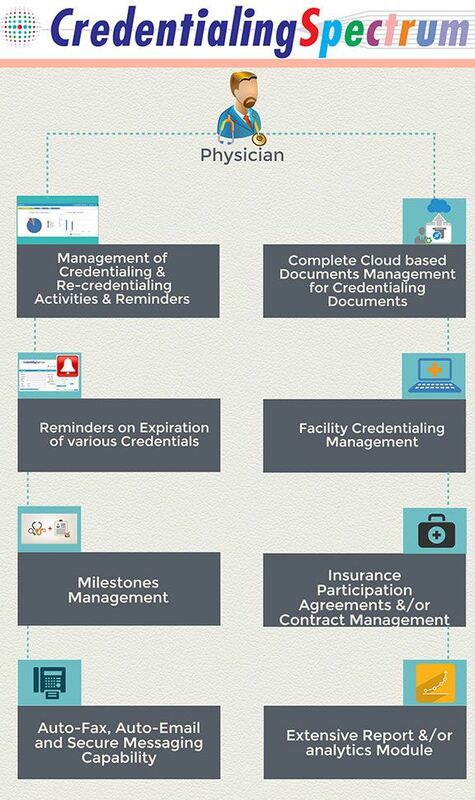 The management of credentialing and re-credentialing activities allows users to manage the credentialing assignments by inputting the contact details for the specific payers, various ongoing time stamped remarks, creation date as well as follow up date for a more streamlined tracking process of the assignment. The document management tool allows seamless cloud based document uploads and management, customizable template creations specific to clients, providers and facilities as well as individual expiry dates on the uploaded documents. Document module contains the list of features such as “Create category”, “Upload documents”, “Download documents” and “Document viewer”. 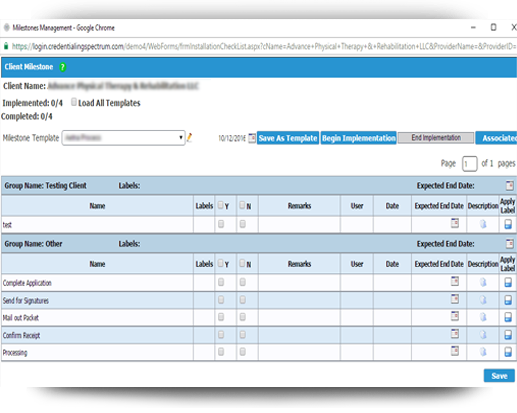 Users may also import a customizable document template for specific document management. Uploaded fields will be displayed into the grid shown in the attachment module. 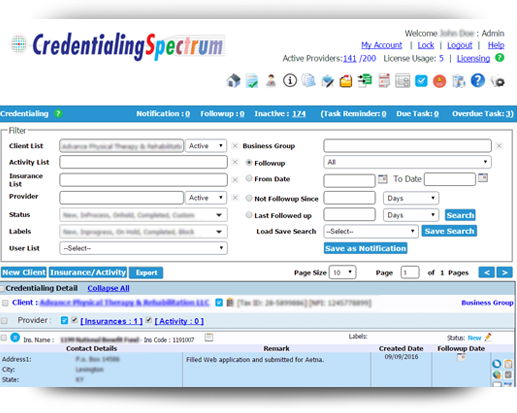 Reminders on various credentialing documents allow the user to be notified in advance on which documents are due to expire and need attention. 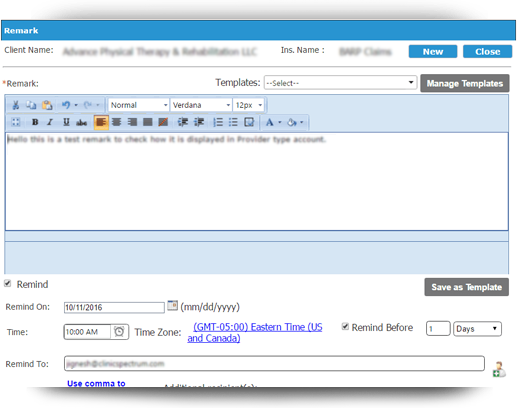 The auto reminder is set by the user and then emailed to the designated email address on file as set by the administrator. This tool is very helpful for expiry management and helps to avoid common oversight errors. 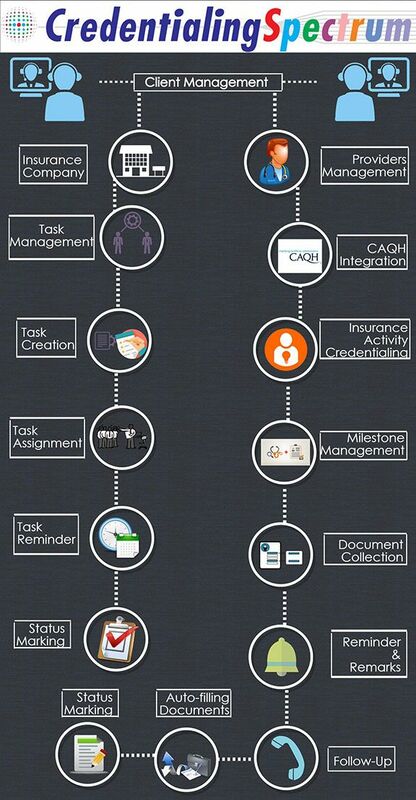 The task management option allows creating and assigning tasks to users for proper management. In the task management window, users can input the subject, description, status, priority, start date, due date and the specific assignee to the task. Directly from this view, users can edit or email the task specifics to a designated recipient. Additionally, users can view the life cycle on the individual task. 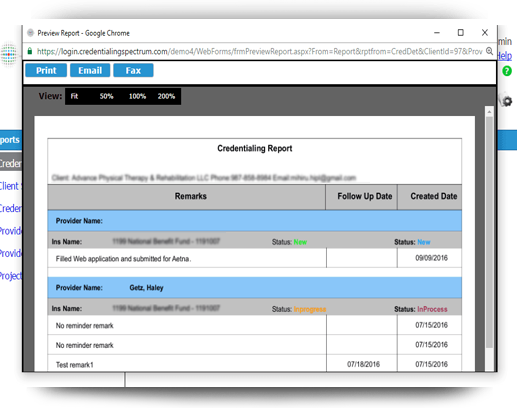 The analytics module shows the clients credentialing report based on the credentialing detail, client summary or credentialing expiration. 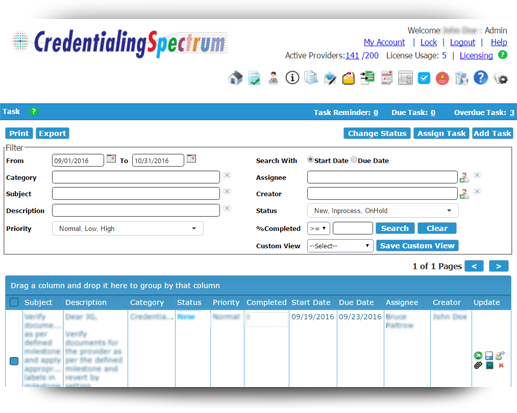 The data holds all the compilation of remarks and follow-up dates for all the credentialing processes carried out for each particular reporting analysis. 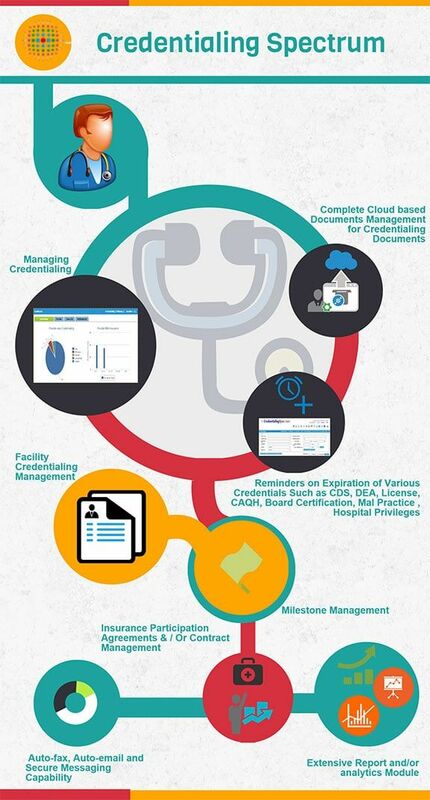 Everyone needs to know the status of Credentialing tasks—what’s in progress and what remains to be completed. 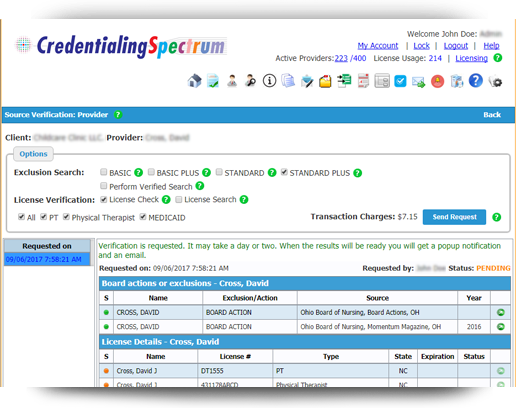 This is acheived by configuring key milestones and displaying progress toward, or the completion of, key milestones so users can view specific activities within the credentialing process. This enables users to quickly know what’s completed, needs to be done, is past due, and what are the new tasks that are entering the process. Reminders on Expiration of various credentials such as CDS, DEA, License, CAQH. Library of fillable Credentialing and other Forms. Powerful, Impressive and so easy to Use! I liked the way product is integrated with CAQH and Auto form population. Perfect reminders which helps me everyday to make sure I am on always on it. 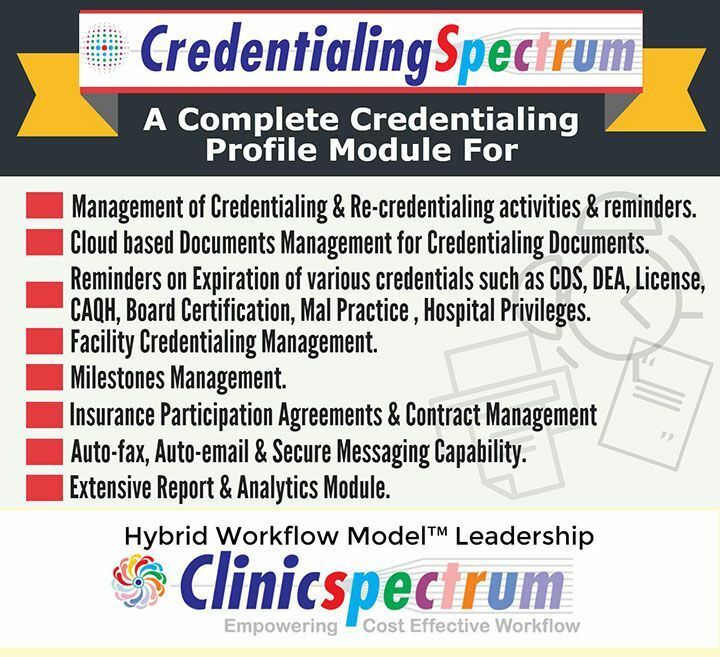 Clinicspectrum is a healthcare services company providing outsourcing/back office and technology solutions for 17+ medical billing companies, 600+ medical groups/healthcare facilities including hospitals, and hospital medical records departments. The company is promoted by technical experts from diversified industries. 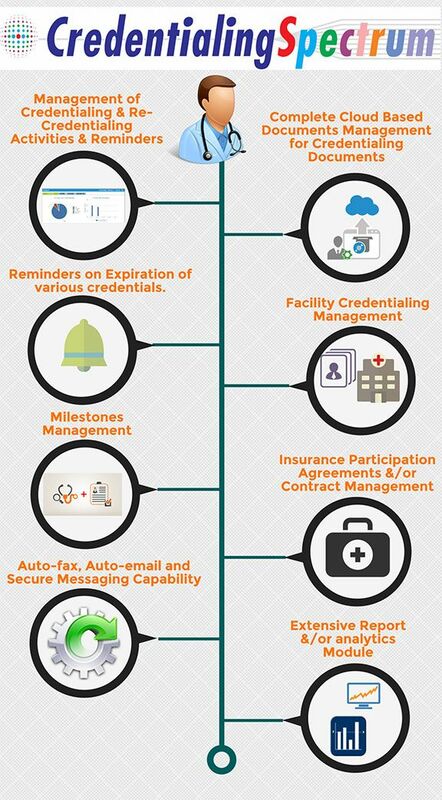 In a span of 15 years, we have been able to transform several billing companies and healthcare facilities nationwide into efficiency engines. Our strategy is to build productivity through the use of technology, highly trained personnel who deliver results in a timely fashion, and customized consulting services. 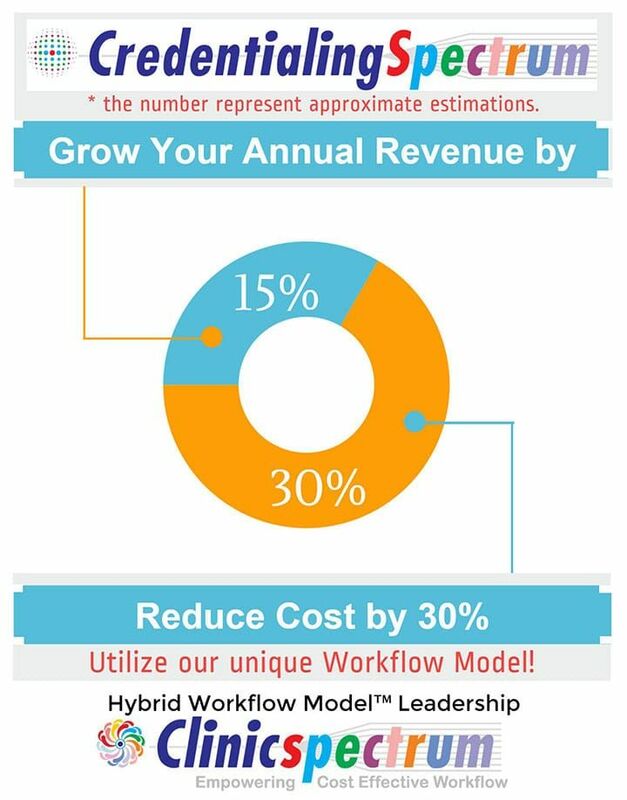 With resources composed of 52+ employees nationwide and 350+ back office employees overseas, we have found a solution for all the problems in running a medical billing company and medical practice resulting in better clinical records, revenue cycle, and administrative task management. © Copyright 2012. Clinicspectrum, All Rights Reserved. The document management tool allows seamless cloud based document uploads and management, customizable template creations specific to clients, providers and facilities as well as individual expiry dates on the uploaded documents. 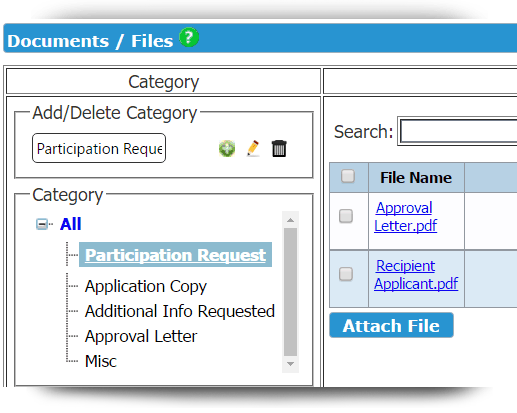 Document module contains the list of features such as “Create category”, “Upload documents”, “Download documents” and “Document viewer”. Users may also import a customizable document template for specific document management. Uploaded fields will be displayed into the grid shown in the attachment module. Users can search by the title, category, effective – expiry date, description. This module will help users search documents easily when there are number of documents on file. Here, users can add or edit effective date and expiry date for the document. This functionality will manage and find the documents due to expire. 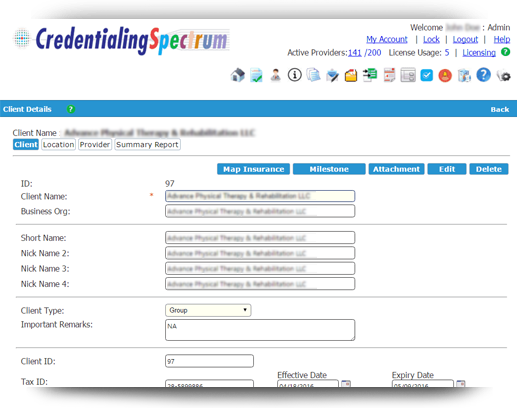 Credentialing spectrum’s service provides the notification for upcoming expiring documents. Users can add/edit description for documents and add short notes for easy identification or highlighting purposes. This will allow you to download the document from server. This will allow you to delete files from the server, using a password protected command. It will confirm before deleting any document from the server and verify by password login to complete the deletion. 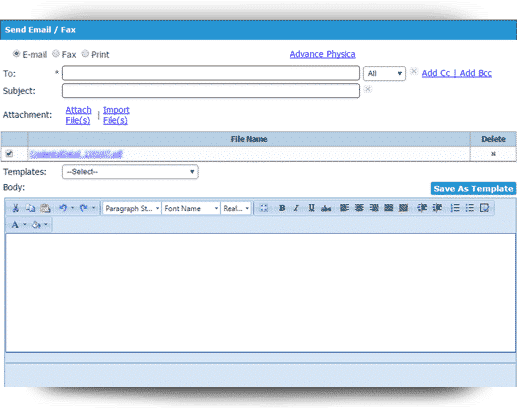 Users can email or fax document from the attachment module. This will allow you users to send documents as an attachment. This will allow you to print out the document if it is in a printable format. It will only print the document as a PDF or an image. For a new client, “Client Name”, “Client Type” and “Status” are compulsory fields that should be entered to create a new client. This module is used to maintain the client’s details such as the client name, business organization, short name, client ID, tax ID, and other important remark information. 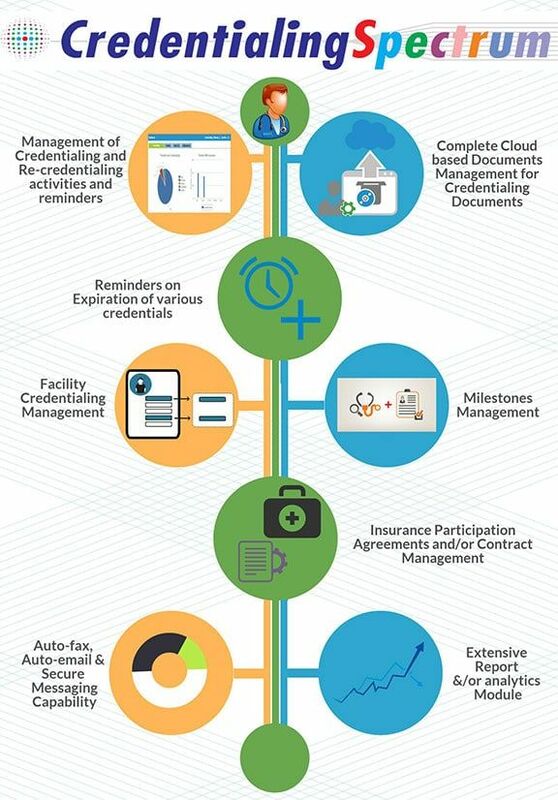 The insurance participation agreements and/or contract management is part of the document management portal within the credentialing platform. Users can import/upload specific named documents in the portal and have easy access to retrieve them at any given time. Users can manually subtitle the category or import a template previously created by the user/administrator. 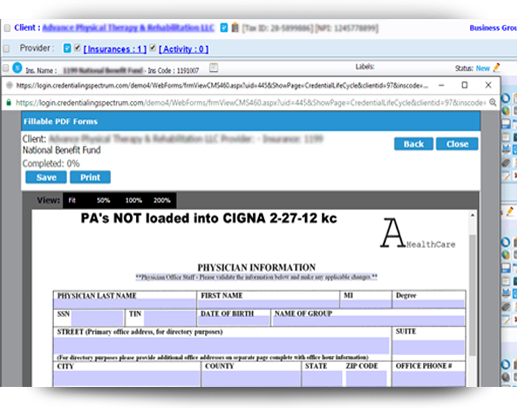 The documents saved in this portal can also be emailed, faxed or previewed directly from the document management screen. Library of fillable PDF forms is managed and it allows users to add and map new fillable PDF forms.